Big chunks of the world take the day off on Christmas, and I see no reason that DaedTech should buck the trend. 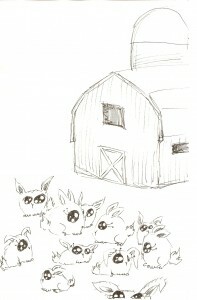 So, instead of your usually scheduled Friday post, please enjoy this festive, non-sequitur drawing of a bunny farm. And, of course, for all Christians reading, have a Merry Christmas! (And to everyone else, hopefully you get to enjoy a relaxing day off).